An Idiot Abroad was devised by Stephen Merchant and Ricky Gervais and the concept is that they send their friend Carl Pilkington to the seven wonders of the world. Along the way Carl is put into uncomfortable situations for the amusement of Stephen, Ricky and the audience. Very little time is actually spent within each episode focusing on each wonder of the world; rather the audience gets to witness Carl bumbling through encounters with locals. Stephen, Ricky and Carl have long worked together on radio, creating podcasts on a whole range of different topics. When the three of them are together it is very funny as they balance each other out and they are able to bounce off each other. By moving Carl to another country and having Ricky and Stephen as the invisible puppet masters that balance is destroyed. Carl, on the whole, simply comes across as idiotic and a whinger. It annoyed me having to watch someone who clearly didn’t care that he was able to visit the seven wonders of the world. Ricky and Stephen come across to the audience as bullies. They intentionally choose things for him to do and places for him to go too and they know that he won’t enjoy them. This is not funny or entertaining. The reason for this is that any ordinary person would dislike doing these things, such as making cow dung patties, and I don’t want to watch someone complain about things, even if they are obviously disgusting or bizarre. 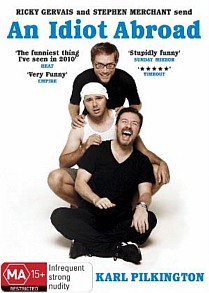 I was very excited to see this show as I am a huge fan of Ricky, the creator of Extras and The Office, as well as Stephen, he had a role in and helped write Extras, and Carl has always made me laugh. I thought that this show would be constant laughs but sadly I found myself on laughing very rarely. I found watching this show tiresome and the only episode that was worth watching was the final episode. In this episode the three men recapped the entire series, showing a highlight real and joking between themselves about the things that happened to Carl. If they had had this format throughout the series then it would have been far more amusing. As it is the show is ruined by the solitary nature of Carl’s roaming. Without Ricky and Stephen there, or anyone else, to balance out Carl it just becomes a man whingeing in front of some wonderful places that I would love to visit.